A postcard showing the Topeka Owls, an American minor league baseball team in Topeka, Kansas. 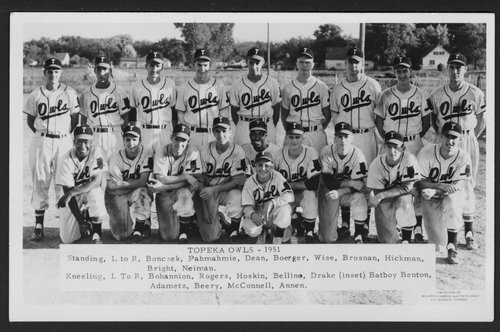 In 1951, the Owls finished first in their league with a record of 74-44. They were affiliated with the Chicago Cubs. Players are identified as: standing (left to right) Bonczek, Pahmahmie, Dean, Boerger, Wise, Brosnan, Hickman, Bright, Neiman, and kneeling (left to right) Bohannion, Rogers, Hoskin, Bellino, Drake, Benton (batboy), Adametz, Beery, McConnell, and Annen.